Many of the world’s leading economies have yet to embrace the much-needed reform of labor markets, entitlements and other policies that are fundamental to driving sustainable economic growth. The commoditization of information continues to enhance market efficiency. In the long run, our performance will be driven by the magnitude of the competitive advantages we build in the areas that matter. In 2017, we will invest in key initiatives across areas such as our capital allocation process, portfolio implementation and trading strategies, modern data science and system design. These initiatives will drive our competitive advantage over our next quarter of a century. 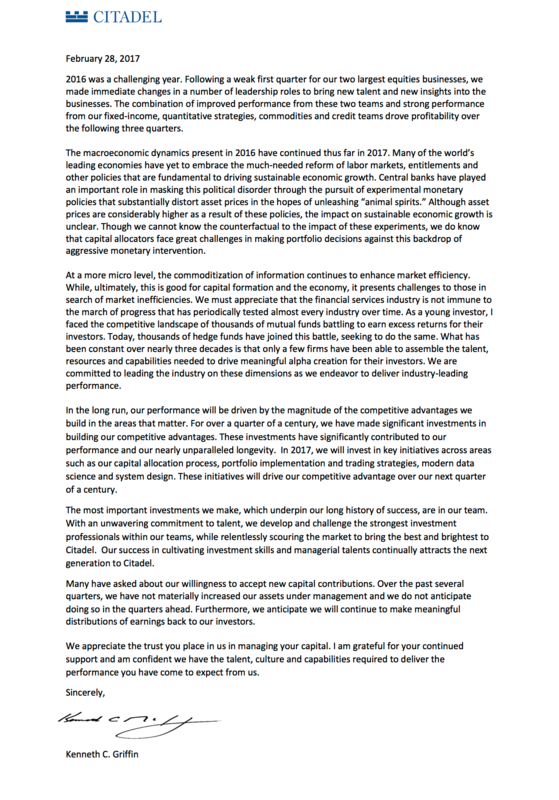 The full letter from Ken Griffin is below.